Voodoo is earmarked for dual purpose Police K9 or SAR. We selected her at 7 weeks for work after flawless testing. She will be certified at our Level 2 trailing cert by ten months and should be ready for work on moderate real world trails. She will also be trained in the five basic narcotics odors if going to LE.1020.2012 – Voodoo Tactical Trail 2Voodoo working her first tactical trail with SWAT support. 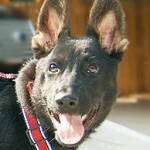 She is an excellent GSD pup with amazing capabilities already at this young age. Few pups at nine months show her level of commitment to a trail.This one was unmarked with a surface change and a fair amount of distance. She absolutely rocked it. Take a look at the video again and you will see a classic GSD proximity alert from about 100 yards out (approx 2:07) . As Voodoo runs the fence line, she suddenly speeds up, hops a little and puts her nose in the air. She looks straight ahead, then turns to the right and gazes towards the metal building the subject was hiding behind. She then goes to the trail and continues to follow but faster. You can tell the speed increase by the noise I am making trying to keep up. The precursor body language I just mentioned coupled with the new speed is an FBI clue that the handler is getting close.